So I put up a “gig” on Fiverr about five months ago. 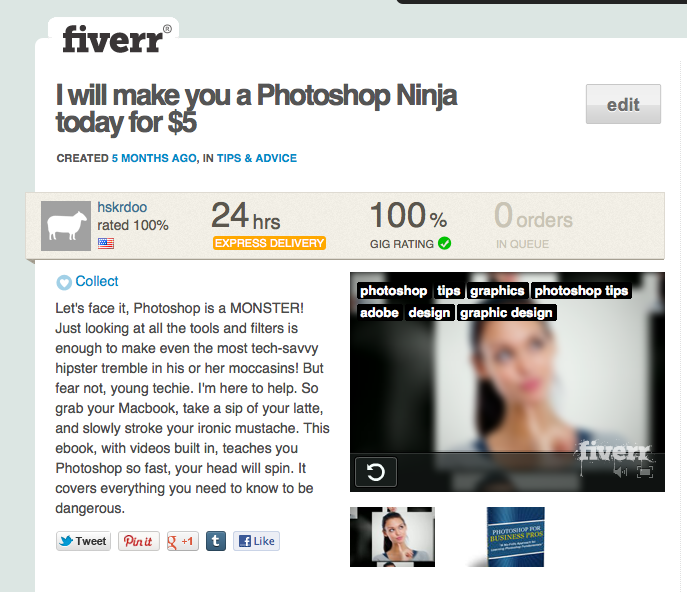 For those of you not familiar with Fiverr, it’s a site where people do things for $5. There tons of random things people are willing to do (like burp your name and record it) and most of them seem pretty useless. 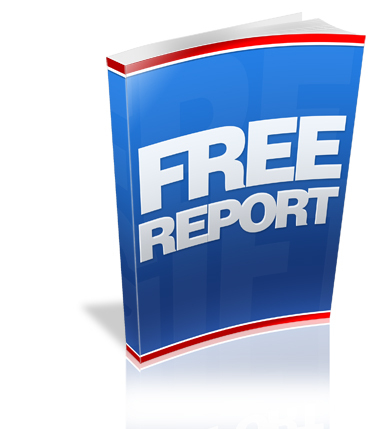 But there is also a number of listings that provide useful services like simple logo designs or article writing. I put up my gig to sell my Photoshop ebook. I think I got around two sales in five months. So I decided to change it up a bit. I spiced up the ad copy and made it a little more humerous and I added a video to the gig page. I used my new Animoto software of course 🙂 Now I am going to see if adding video and new copy makes any difference at all. I’ll keep you posted. Here’s a link to the page if you want to check it out. This post isn’t elearning related but I still wanted to share it with you. I learned a pretty cool (in my opinion) trick in Google Docs so I recorded a quick video. Hope you find it helpful. I just discovered a video creation tool called Animoto and I created this video using it. The video took about 15 minutes to create (including tweaks and edits). I’m very impressed with the software; so impressed in fact that I upgraded to the $5 a month version. The main advantage of this paid membership is the ability to download your videos to your computer. The free version does not let you do this. Plus this paid version comes with a nice library of background music and a few more video templates. It does come with some free photos and videos but they are not very impressive. The only problem I have with my level is that you still have an Animoto logo that is on the end of every video. But I think you can remove that if you purchase the more expensive package. Check out my video below and let me know what you think! For more tips, check out my book “45 Elearning Tips and Tricks” now available in the Kindle bookstore. Or if you are new to elearning and want some advice, try my other book “How to Create an E-learning Course” It’s a blueprint for getting into the field of elearning development. I couldn’t sleep last night so I decided to record this quick video. I share my method of creating an outline for any training course. Hope you like it! I created a video to promote my book “How to Create an E-learning Course.” It basically covers what is in the book and my reason for writing it. Enjoy! 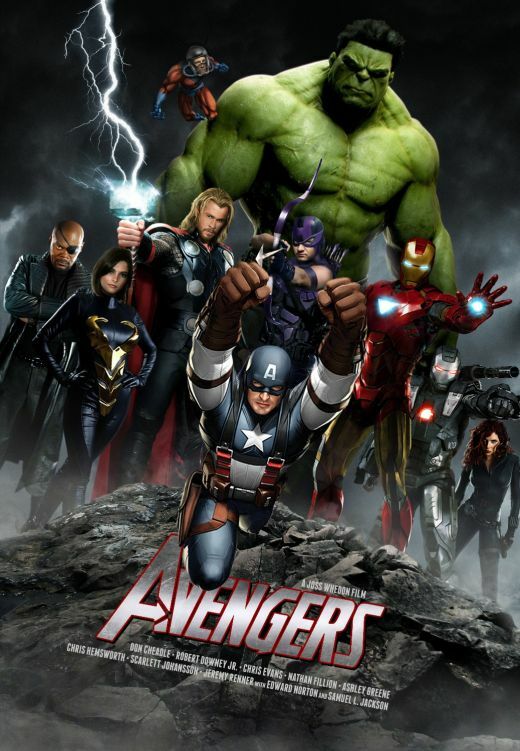 What can the Avengers teach you about elearning? Most of you have probably purchased your tickets for the midnight showing of the Avengers. I know I have. Experts are already predicting that it will have the biggest opening of the year so far, which makes sense because it’s one of the most hyped movies of the last few years. So why are people so fascinated with the Avengers and what in the heck does it have to do with elearning? My assertion is that we love each members of the Avengers. They are brilliantly unique in their own ways, yet the form a cohesive, bad guy destroying, mega-group. And they all have many of the same traits as elearning developers. The Hulk is a physical specimen and he is the Avenger’s wild card. They never know what to expect from him next. When he does decide to “Hulk Smash,” he puts his entire body and soul into it. Be like the Hulk with your elearning development. Stop being so predictable! Throw away all of your old templates and clip art. “Smash” all of your tired old multiple choice and true/false questions. Keep your learners guessing. Remember, the more angry the Hulk gets, the stronger the Hulk gets. Get mad at your old courses. It will give you the strength to create a new course that is truly epic. Thor is the son of the god, Odin, and he comes from the magical world of Asgard. His godly upbringing also makes him the most headstrong member of the Avengers and he uses his mighty hammer to destroy anyone who stands in his way. Have you ever been the “Thor” of your company? Have you ever been so headstrong about making changes to your courses that you emotionally destroy anyone who opposes your ideas? Have you ever failed to heed all warnings and instead ran into battle against the throngs of merciless beta testers with only your hammer by your side? Most of us are probably guilty of a little hubris from time to time. We all get touchy about the courses we spend weeks or months creating. But we all need to set our egos aside, once and awhile, and listen to what other people have to say. Most feedback is helpful and it can help us create courses that our end users will love. Captain America is the original Avenger. He is also the most level headed and humble of the heroes. He often butts head with Tony Stark because Ironman craves constant attention for his actions, while Captain America would rather do what is right without receiving any recognition. As elearning developers, we are a lot like Captain America. We work behind the scenes; we are not the faces or our organizations but we are vital members. We don’t do our jobs for attention but we are noble as heck! Face it, trainers get all the attention and love every minute of it. I’m just kidding (I love my trainer buddies). Although he may not get any of the recognition, the Avengers would be nothing without the Captain. And your organization would be in a world of hurt without you. For more elearning tips, check out my book “45 Elearning Tips and Tricks” now available in the Kindle bookstore. Or if you are new to elearning and want some advice, try my other book “Become an Elearning Developer Today!” It’s a blueprint for getting into the field of elearning development. In my book, How to Create an E-Learning Course, I mention the importance of having an elearning portfolio available online. To summarize, in this economy more people than ever before are competing for elearning jobs and before you ever get an interview you will be asked for a portfolio. 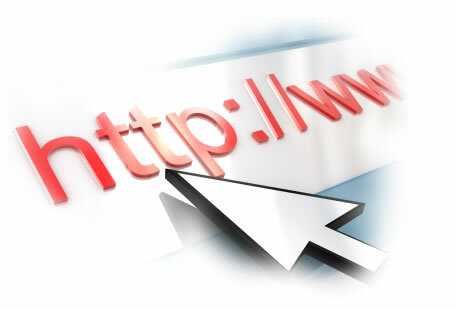 There’s a great post on the same subject on The Rapid Elearning Blog. I would highly advise reading it. 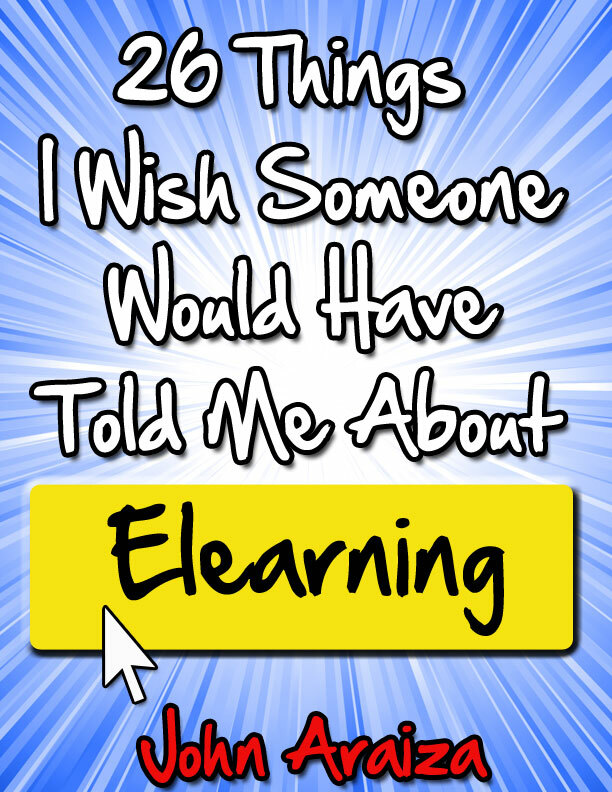 For more elearning advice, check out my books “45 Elearning Tips and Tricks” and “26 Things I Wish Someone Would Have Told Me About Elearning” now available in the Kindle bookstore. Once you finally decide to do it, it’s an eye-opening experience. The things you assumed would be completely obvious don’t seem so apparent when you watch other people taking the course. But this is not a bad thing; in fact, it’s a very good thing. It may hurt your ego a bit because you realize you’re not as big a genius as you thought you were, but it will make you a better developer in the long run. And it will make your courses better as well. For more tips, check out my books “45 Elearning Tips and Tricks” and “26 Things I Wish Someone Would Have Told Me About Elearning” now available in the Kindle bookstore. Or if you are new to elearning and want some advice, try my other book “Become an Elearning Developer Today!” It’s a blueprint for getting into the field of elearning development. Please let me know what you think about it. I always appreciate feedback. For more tips, check out my book “45 Elearning Tips and Tricks” now available in the Kindle bookstore. Or if you are new to elearning and want some advice, try my other book “Become an Elearning Developer Today!” It’s a blueprint for getting into the field of elearning development.